Annual; caespitose. Culms erect; slender; 20-50(-60) cm long. Culm-internodes distally hirsute, or hispid. Leaf-sheaths hispid; with tubercle-based hairs. Ligule a fringe of hairs; 0.5-1.5 mm long. Leaf-blades 5-15 cm long; 2-7 mm wide; light green. Leaf-blade surface glabrous to hispid; hairy on both sides. Leaf-blade margins tuberculate-ciliate. Inflorescence a panicle. Panicle open; ovate; 7-15 cm long; 0.25-0.33 of culm length; with spikelets clustered towards branch tips. Primary panicle branches ascending, or spreading; 1 -nate. Panicle axis glabrous, or pubescent. Panicle branches stiff; bearded in axils. 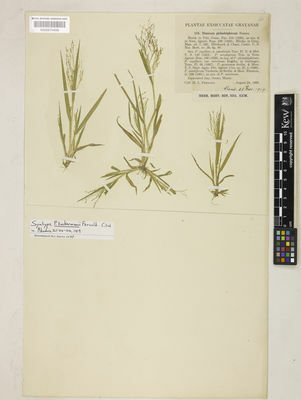 Spikelets appressed; in pairs. Fertile spikelets pedicelled. Spikelets comprising 1 basal sterile florets; 1 fertile florets; without rhachilla extension. Spikelets elliptic; dorsally compressed; acute; 1.2-2(-2.2) mm long; falling entire. Glumes dissimilar; reaching apex of florets; thinner than fertile lemma. Lower glume ovate; 0.33 length of spikelet; membranous; without keels; 5 -veined. Lower glume apex acute. Upper glume elliptic; 1 length of spikelet; membranous; without keels; 5 -veined. Upper glume apex acute. Basal sterile florets barren; without significant palea. Lemma of lower sterile floret similar to upper glume; elliptic; 1 length of spikelet; membranous; 5 -veined; acute. Fertile lemma elliptic; dorsally compressed; 1.3-1.7 mm long; indurate; shiny; without keel. Lemma margins involute. Lemma apex acute. Palea involute; indurate. North America: eastern Canada, north-central USA, northeast USA, south-central USA, and southeast USA. Panicum capillare var. campestre Gatt. Panicum capillare var. geniculatum Scribn. Panicum capillare var. philadelphicum (Bernh. ex Nees) Steud. Panicum capillare var. sylvaticum Torr. Panicum minimum (Gatt.) Scribn. & Merr. Ibrahim, K.M. & Peterson, P.M. (2014). Grasses of Washington, D.C. Smithsonian Contributions to Botany 99: 1-128.